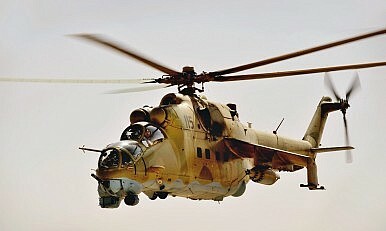 India has yet to hand over the last of four Mi-25 (Mi-24D) helicopter gunships to the Afghan Air Force (AAF) due to missing parts from Russia, according to local media reports. The helicopter is currently grounded at the Indian Air Force station in Pathankot in the Indian state of Punjab. “The fourth helicopter is yet to be transferred. It needs spares before it can be made fully operational and the spares have to come from Russia,” an unidentified source told The Hindu. However, Indian defense officials are optimistic that the problem will be resolved shortly. “There was an issue with the spares. It is being sorted out. It should be delivered very soon,” a senior defense official said. The AAF has been suffering from a lack of Russian spare parts for its fledgling fleet of five Mi-35s gunships, supplied by the Czech Republic in 2008, which has kept most of the helicopters grounded during this year’s fighting season. Western sanctions against Russia and the resulting inability of NATO countries to purchase Russian-made hardware for Afghanistan have aggravated the problem. During an official visit to India in August, the top U.S. commander in Afghanistan, General John Nicholson, asked India to step up its military aid to Afghanistan, especially in the field of combat aviation (See: ”US General Asks India for More Military Assistance in Afghanistan”). “We need more aircraft, and we are looking at how we can meet that need,” the general said. The Mi-25 is a close-air support aircraft armed with a YakB four-barreled, 12.7 mm, built-in, flexibly mounted machine gun, as well as rocket and grenade launchers. It can be deployed against ground troops including armored and slow moving air targets. It can also serve as a low-capacity troop transport (up to eight paratroopers), and be used for medical evacuation missions. “The Afghans have asked for more of these helicopters. There is an immediate need for more. When these aircraft come in, they immediately get into the fight,” Nicholson said. However, as of now, the IAF has not agreed to supply additional helicopter gunships to Afghanistan. India’s Plans to Buy Helicopter Gunships for AfghanistanIndia Considers Stepping up Military Assistance to AfghanistanIndia Delivers 4th Combat Helicopter to AfghanistanUS General Asks India for More Military Assistance in Afghanistan Will India Deliver Attack Helicopters to Afghanistan?